I can’t tell you how excited I am about all of the great products that will be available with the release of the Occasions Mini on January 4th. There is a wide variety of styles and items to choose from. I had such a hard time deciding what I was going to pre-order. If I had a money tree in my backyard I would have ordered one of everything! The cards I have to share with you today both feature the new Build A Blossom Stamp Set and the coordinating Blossom Petals Punch. I was completely caught by surprise at how much I love this stamp set and punch. I have to tell you the story behind how it came to be mine, here goes: I sat down at my computer to place my pre-order on December 1 with my list of “must have’s right now”. Just in case you’re wondering, there are 3 categories to my Wish List, 1. Must Have’s Right Now, 2. Must Haves and 3. Might Need Later. Well, the Build a Blossom Stamp Set and Blossom Petal Punch barely made my “Might Need Later” list, I was not that crazy about it. So, back to how I got it – I had finished entering in my order and I ended up getting the Build a Blossom Stamp Set with my $20 Hostess Credit, so of course I had to go back and add on the punch to my order. I figured getting it for free was the only way I was going to get it and now I LOVE IT! Out of all the items I pre-ordered, it has received the majority of my attention. 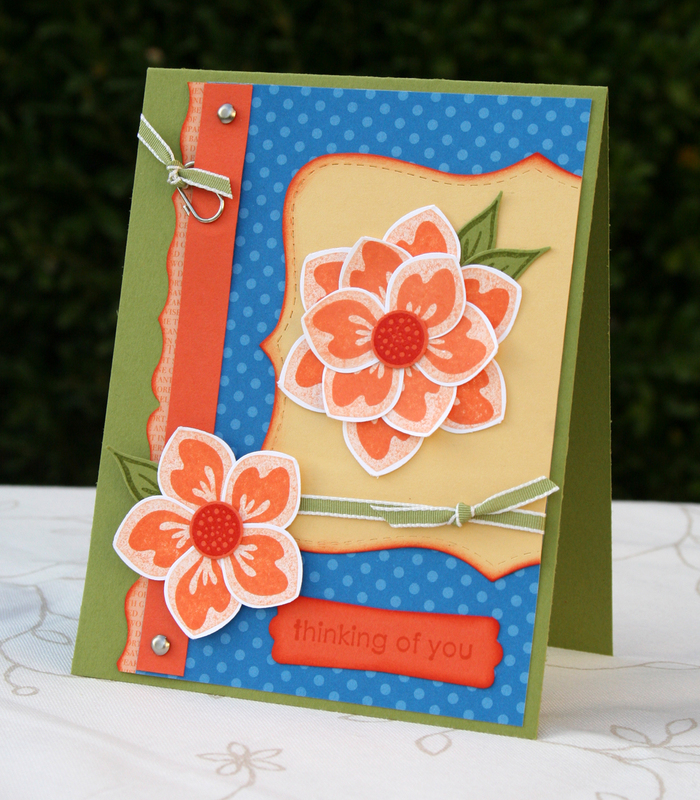 The Build A Blossom Stamp Set has 5 possible petal images, 2 leaves and 2 centers. There are several flower possibilities with this set, and the best part is, there is no cutting! It’s so easy to use, just stamp the petal or leaf you want and punch t out. It can’t get any easier than that! I like this set so much I have dedicated any entire class to sharing tips and tricks on using the stamps and punch together. The class is on April 9th. Merry Christmas to you and yours! Check back tomorrow for another sneak peek. Very pretty! I love those colors on both cards! You make it look so easy! Thanks for sharing another awesome creation!